As wonderfully talented as Kyrie Irving has been since he entered the League, he never really got his just due until the 2016 Finals. The Cavs floundered in mediocrity when it was just Kyrie as the headline act and when LeBron came to town with Kevin Love, Kyrie was reduced to being the lead guitarist. All that changed when Kyrie dominated the point guard matchup with Curry including the shot that put the Cavs up for good in the Finals. Still, the potential was always there. Kyrie’s otherworldly talents—particularly his ballhandling and scoring—were a big reason LeBron saw it fit to make a return back to Northeast Ohio. Those same gifts were what Nike saw in blessing Irving with a signature shoe (as the story goes, Nike had prioritized Irving over Curry). Three years later, we’re on the Kyrie 3 and Irving is in position to be the frontman of the Cavs in a few years as 32-year-old LeBron will likely begin to lean on the younger stud to chase Michael Jordan’s six rings. Until then, let’s see how the Kyrie 3 performs. 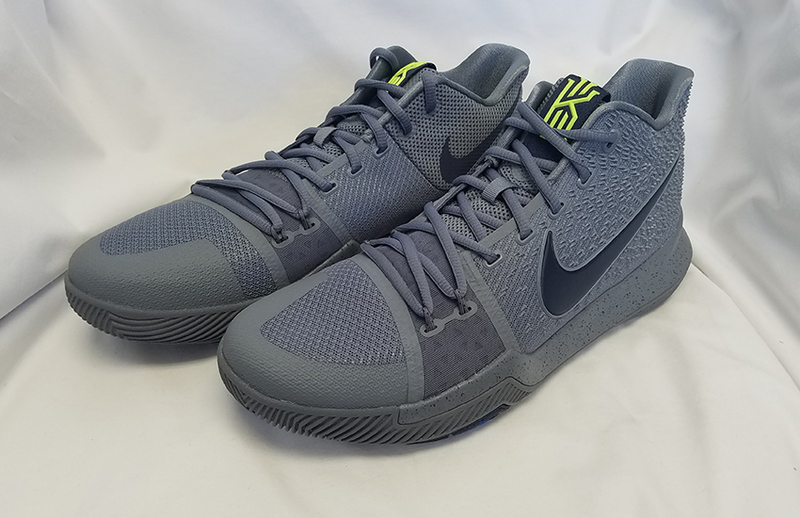 The Kyrie 3 features two traction pods in the forefoot (one on the medial and other on lateral side) for enhanced grip. I found the pods’ rubber to be softer and stickier than the rest of the shoe which resulted in excellent traction in the forefoot on any floor, making it a boon for lateral cuts. 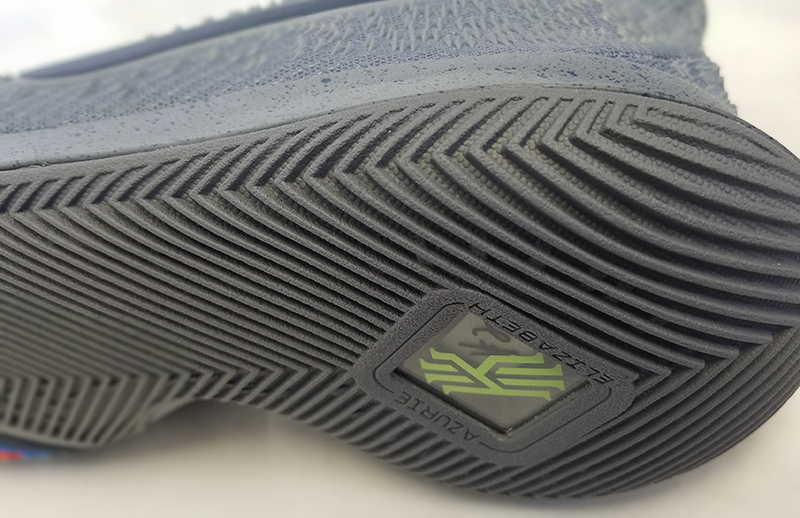 The rest of the outsole is a firmer rubber that features a modified wide herringbone pattern and doesn’t have the same gripping power as the pods. Since the pods protrude a little bit, I found they would bite the floor a little more than the rest of the shoe. At the same time, I’d have some spin-outs in the heel while the forefoot stuck like glue. The outsole treads extend up the midsole on both medial and lateral sides. Given Irving’s unpredictability in direction on the court, this feature likely helps him on toe-offs and pivots. Overall the traction pods worked better than the rest of the shoe, resulting in inconsistent performance overall. 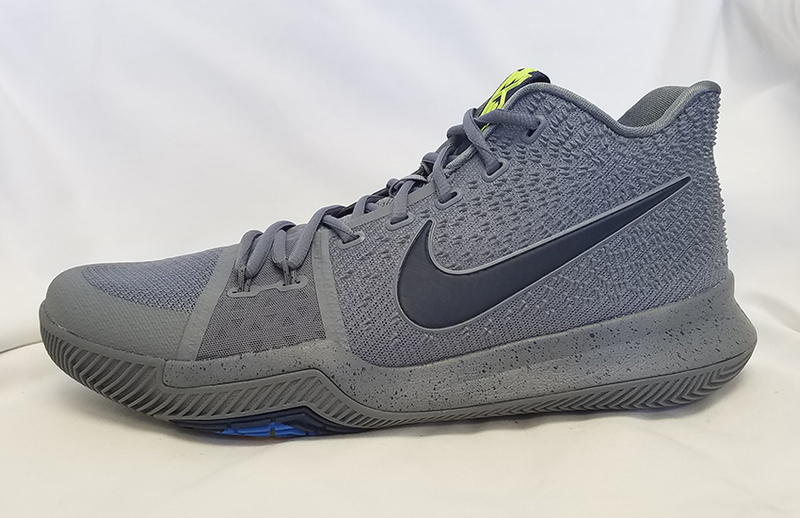 The Kyrie 3 features Zoom in the heel and full length Phylon, an identical carryover from the Kyrie 2. 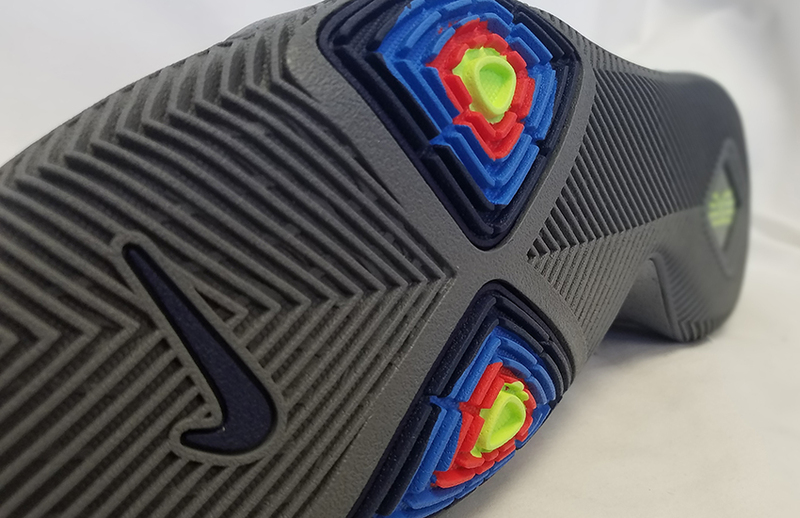 The only difference is that Nike made the insole thinner than last year’s but the end result is similar: low to the ground, responsive and very firm cushioning. I had a hard time feeling the Zoom even after ample break-in, but it does soften a touch. The likely culprit of the cushioning setup shortfalls is the $120 price tag. Nike is positioning the Kyrie line as an entry signature model and given Irving’s popularity with the younger set, it’s more aimed toward wearers who depend on mom, dad or Christmas and birthday cash to get fitted for a pair. A pair of young knees might not feel it, but a more, um, seasoned player would appreciate a more intricate cushioning system. If you’re that or expecting or wanting the soft feel of full length Zoom, look elsewhere. I went true to size with the Kyrie 2 and I did the same with the Kyrie 3. These run true to size lengthwise so regular and narrow footers will want to go true to size. Wide footers will want to go up for comfort reasons as these run narrow in the midfoot like the previous models. The Kyrie 3 started off a little tight for me since I’m a wide footer but broke in within a few hours to give a good fit. No movement side to side and zero heel slip which is great in my book. The materials of the Kyrie 3 are similar to the Kyrie 2. Nike utilized a thin fuse on the lateral side for strength and containment and a softer mesh on the medial side and toe box for flexibility. One feature that is marketed by Nike is the forefoot flex zone. Nike used a thinner mesh and Flywire to allow extra flexibility at the forefoot. I don’t feel it stretches at all but that thinner mesh allows for a more natural flex area. Plus it’s hard to quantify if it really works since the rest of the upper is so much stiffer than this little area. The most noticeable feature of the upper lies in the textured Kurim layer on the lateral side that resembles the scale-y, bumpy and spiky skin of a reptile. It’s there for durability but we’re not sure how much the pointy studs add to that, but it does give the shoe some texture and visual interest. 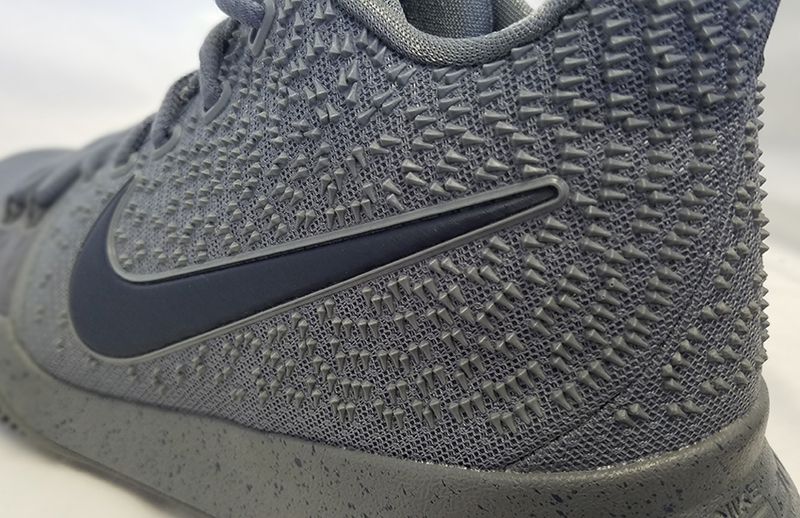 Support is good with the Kyrie 3 due to the fit, heel counter and stiffer fuse on the lateral side. Although the upper starts off stiff, it becomes more flexible with play like the Kyrie 2 so don’t count on that structure to save any ankles. Stability is very good despite the curved outsole similar to last year’s. 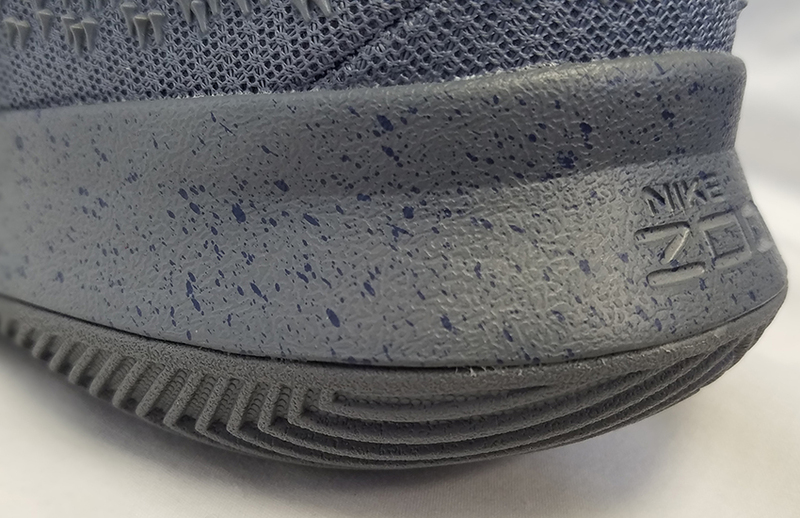 No excess tippiness in the heel and a widened outsole at the forefoot add to the stability of the Kyrie 3. Given the amount of torque Kyrie puts on his shoes with every crossover, Shammgod and spin move he makes, it comes at no surprise that containment is very good. 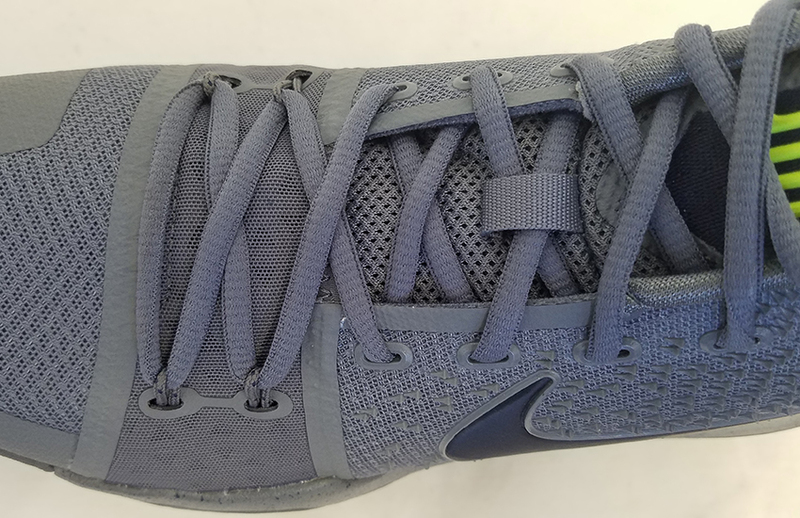 The combination of a stiffer fuse on the lateral side, Flywire, and a raised midsole at the forefoot all help to keep the foot in place on the most complex moves. Gone is the strap from the Kyrie 2, but truth be told, it didn’t provide much real lockdown and was more for aesthetics. 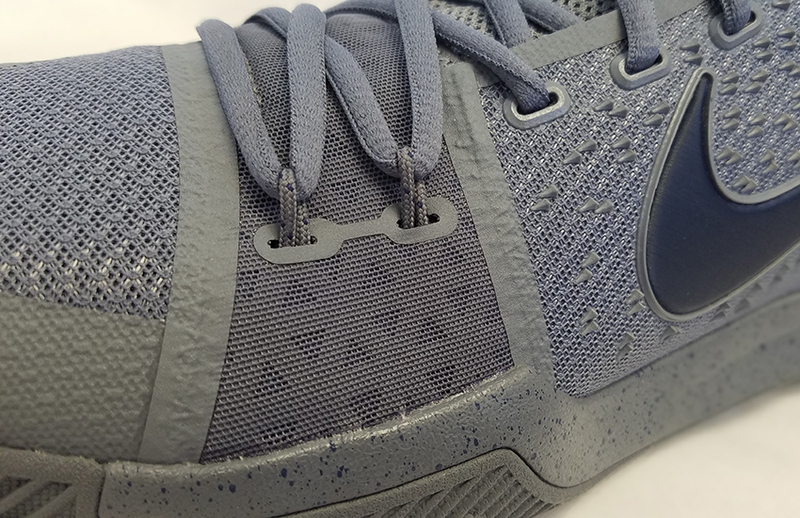 Many wearers of the Kyrie 2 even went as far as removing the strap altogether. Nike has been very consistent with the Kyrie line since debuting in 2014. Each shoe has featured an aggressive outsole pattern, fuse uppers, a midcut ankle collar and a tight fit especially at the midfoot. The Kyrie 3 performs almost exactly the same as its predecessor and isn’t anything groundbreaking—a good thing if you liked previous iterations. Much like the player it was developed for, the Kyrie 3 is a low-to-the-ground shoe that shines in lateral mobility and direction changes. If you favor a soft landing, the Kyrie 3 is probably not your best bet. It’s a guard shoe and makes no effort being anything else. At $120 it won’t break the bank and if you’re reading this, you might even find it for less for certain colorways. Like Kyrie the player, the Kyrie 3 is slowly developing and it won’t be a big stretch to see it as one of Nike’s top tier signature shoes in the near future.